Las Vegas, Nev., March 3, 2014 — Loosely translated from Spanish to English to baseball, the term caballos refers to a teammate who is particularly powerful or influential – a big horse, a stud, a brute, a beast. 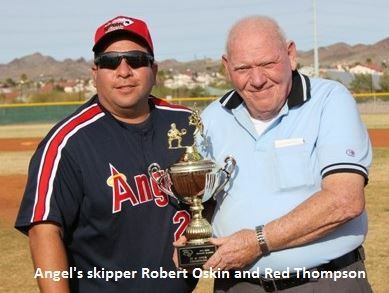 Members of the Montebello Angels reserved that term for two of their players – Bobby Yanez and Mario Chavarin – and it’s well deserved. Yanez (2-1) started the first three games of the tournament and threw a total of 23 innings. Chavarin (3-0) started both playoff games and the championship and threw a total of 21 innings as the Angels powered their way to a 35-and-over title with a 17-5 win over the top-seeded Chicago Woodpeckers. The Angels banged out an obscene 31 hits on the day including a 5-for-5 performance by Frank Rodriguez, and four hits each by Bobby Ruiz, Kenny Lumpkin and Fugi Esparza. Chavarin and Yanez shared tournament MVP honors with Kenny Lumpkin, the team’s leading hitters. Lumpkin notched 20 hits in six games, including 10 doubles. Esparza had 18 hits and Fidel Jacobo had 17 hits. The Angels’ only loss of the tournament was a 5-4 loss to the High Desert Dust Devils in the tournament’s second game. They went onto beat those same ‘Devils 17-5 in the semifinals with Chavarin earning the win with five strong innings. Chavarin also threw a complete-game in a 7-1 first round playoff game against the Utah Rounders. In his third consecutive start Chavarin allowed four runs on 14 hits in six innings. Eric Orue entered in the seventh inning with an 11-4 Angels lead and earned the save. Orue allowed a run on four hits. The Angels jumped out to a 5-0 lead after three innings and never looked back. The Woodpeckers tallied two runs in the fourth inning and again in the fifth to close the gap to 5-4 but that’s as close as it got as the Angels scored 12 runs in the final four innings to run away with it. The Woodpeckers hammered out 18 hits of their own. The Angels lost in the finals at the 2012 Kickoff Classic.